●Izushi-Cho, Uchi-machi, ruins of Izushi castle etc. We consider wearing kinomo, the traditional Japanese cloth, is as a long-term sightseeing feature of Izushi town. 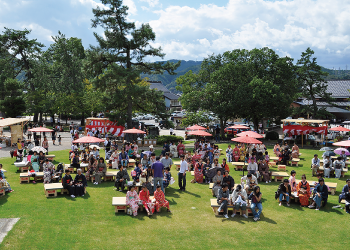 There will be events to encourage wearing kimono at the soba noodle festival, street-shops, rental kimono shops, a contest of kimono wears, historical costume performances, a mystery solving tour or at other events. Please refer for the details from here. *Danjiri festival is celebrating a good harvest of each year, and because of its aggressive style celebration, it is also known as a ‘fighting Danjiri’. Using 17 meter long poles to fight creates a vigorous and compelling sights. 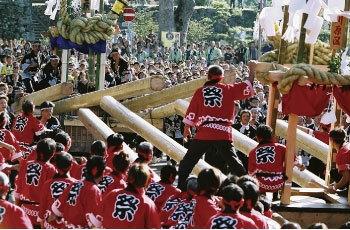 *Danjiri are large wooden carts (danjiri guruma) in the shape of a shrine or temple. 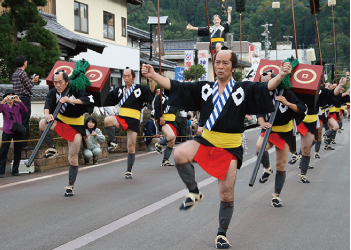 On the 3rd of November every year, the Castle Festival that symbolizes the castle town of Izushi is held. The main attraction of the day is the marching of about 120 people all dressed in traditional costumes, with 30 men holding decorated spears as they walk along. 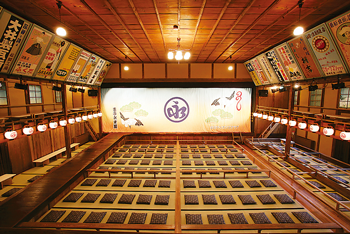 The opening event of Eurakukan Theatre has performed by a kabuki star Ainosuke Kataoka in 2008. Since then, Kabuki plays by Ainosuke are performed every year, who is one of the leading kabuki actors in west Japan and his theatre company. 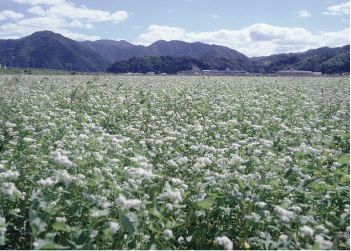 festival with soba noodles made from a new crop. You will enjoy new soba noodles made from a new crop, named with “Hyogo Safety (for health) Brand” and “Stork (nationally protected bird live here) Dance”.